This is my next restaurant to hit. I took my girl to Five Crowns at Corona del Mar. If you love the souffle at Bistro 75, try the one at Five Crowns if u ever visit. Hope you had your stomach full this weekend. Keep up the good work. The souffle looks good, but for that price it better be out of this world. I think you're right, most people wouldn't be comfortable eating classic French food. How sad, the "Americanization" of food continues. 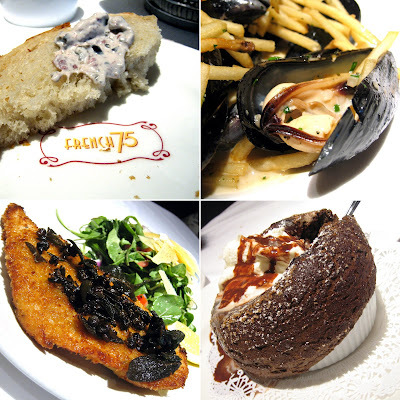 We'd been to Bistro Rouge last year for our anniversary, and it was wonderful! Duck 3 Ways was to die for. Ai-yai - Whenever I start hearing "marketing speak"(i.e. chain wide rebranding) I just kinda get that glazed over look. Five Crowns: duly noted. I see it as I drive by PCH all the time, and have always been curious. Thanks for the tip! It's a good souffle. Probably not the lightest I've ever had, but by far the chocolatiest. It's always a bit of a shock to see the price tag on your check, because of course, you have to order it as you order your meal, and it's not listed on the menu. Yep, Marche Moderne would be my vote for the best French restaurant in the County at this point. I know what you mean. Whenever the marketing part lords over the food part, things never turn out well. The foodie and the engineer in me hates these shenanigans. But the MBA in me is endlessly fascinated at how a business person like Wilhelm attempts to claw to stay on top of consumer tastes, for better or for worse. I kind of wished this happened earlier...then I could've written a killer case study on it! Yet another reason to avoid Wilhelm's Culinary Adventures altogether. There's something too Disneyland-esque about eating at any of the restaurants. They dazzle, but look too closely and you'll find the veneer is paper thin. Thanks for the info but that makes me really sad as i was hoping to try French 75 but if it's just going to be a high-end American type restaurant it may not appeal as much to me with all the other great American restaurants around. Also, those frozen meals from Keller are specially cryovacked to preserve the integrity of the dish; so you won't be getting a Stoufers type frozen meal. http://www.chow.com/grinder/3821 has some info on the Keller thing but if we start seeing Senor Keller burritos I think we can worry. Sorry about the repost but I just wanted to comment on your video. I love the "Ratatouille" (sp?) music from the soundtrack. I love that "Le Festin" song and listened to it all day when I downloaded it. I met Wilhelm long ago. When he catered an event at a hangar in Ontario. For the life of me, I can't remember the event. Too old! i always pass by this place and wonder if it's any good..
That's an apt analogy. When Yvonne Goetz was doing the cooking at Chat Noir, it was an honest-to-goodness French restaurant. Elegant from surface to core. Now it's veering closer (though not quite yet there) to those Wolfgang Puck Cafes. Isn't that just a great piece of music? I have no idea what she's saying, but that melody coupled with her accented purring is the kind of music I don't mind having in my head all day. Also I was tempted to pick up Keller's short ribs (I think that's what they were). It's actually in good company. Most of Costco's frozen food is actually pretty awesome. I'm an avowed Costco addict. Although the idea of Keller's face even being there seems diametrically opposed to what I've read of him, I am thankful that it's Costco and not Walmart. Funny thing about the numbers though. Now that it will be Bistro 75, the number's won't mean much. When it was French 75, at least it referenced a cocktail. Bistro 75 will sound as random as Pho 99. 79, 54. BINGO! It's not bad. But I'd suggest lunch over dinner if you try it. Less expensive and you get pretty much the same thing. For a full out and wonderful French meal, Marche Moderne is better. Plus you can still go shopping afterward (it's next to Nordstroms in SCP)! Reading on everyone else's comments, now I'm curious to know what really French cuisine is as supposed to Americanized French cuisine. I'm not really experienced with that palate. I've only tried places like White House, La Vie En Rose and Ritz. I knew I should have gone to culinary school. To tell you the truth, I'm not sure either what is truly French and what is not. Marche Moderne, which is French by the virtue that the chef/owner is actually a Frenchman, uses things like harissa which are decidedly non-French. But I guess as the world merges into one singular culture, that's natural. Now, how about the French food that the Vietnamese cook up! Damn, I'm even more confused. UPDATE - Hello all, I just ate at French 75 in Newport Beach (Fashion Island) last night, and it was very good, as usual. The food may not be the most excellent French cuisine around, but it is dang good bistro food -- it's supposed to be more peasant-like. And to answer the "authenticity" question, there is a nice mix of classic dishes like coq au vin, dishes that are French in style but are not necessarily in cookbooks (much as a typical French home cook would add his or her own touches to dishes normally), and a few dishes that are very basic and may be considered "American". I only ever order the French dishes, so I can't comment on the generic ones. The update is that the staff I spoke with seemed optimistic that this branch would not, in fact, be turned into a Bistro 75. I contacted Culinary Adventures to express my hope that this was true, and David Wilhelm himself assured me that the Newport Beach location is not going to be converted, although the Irvine Marketplace location is. Hooray! I like the NB location much better anyway. Now, all of you who have been meaning to go, GO! And order the pommes frites, which are excellent! I can also recommend the duck, the crepes, the brioche pudding... aw, just order anything. And enjoy! Great investigative reporting! I've updated the post with the info you found out. By the way, I ate lunch at the Irvine French/Bistro 75 a week after this post and the Newport Beach is far superior, like you said. It is much more polished in the way the food is executed. I want that souffle. Now. That video reminds me of my better dreams. Great post!